As you may recall from my last blog post, the image of the dance is my favorite metaphor for the life of faith. When I said YES to the LOVER of my Soul, I became one with Him. I accepted His invitation to the dance of all dances … one that will never end and is all about Love. HE is the Perfect Dance Partner. He has a strong hold on me and knows the way the dance goes, and He knows the steps. I often try to lead and get Him to go my way. But when I yield to Him moment by moment, day by day, we dance together as I let Him take me where He is going, whisking me along in the way of His Spirit! So the Christian life is all about movement together. And this dance is not just about Jesus and me. We believers, children of God, have been invited into the divine dance of the Trinity. Let me explain. Our early church Fathers of the faith understood the mystery of the Trinity, not in a static way as we modern Christians tend to do, but in an active way, as a a dance. 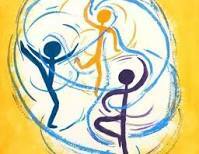 And they had a beautifully descriptive term for this Divine Trinitarian Dance: perichoresis. If you spell out the … Greek word, peri-choresis, you can hear in English what the word conveys: “peri” (from which we get words such as “perimeter”) and “choresis” (from which we get our word “choreography”) — a dancing circle. The word describes the interrelationships of the persons of the Trinity. That in everything God the Trinity is and does, each of the persons relates to and engages with each of the other persons. 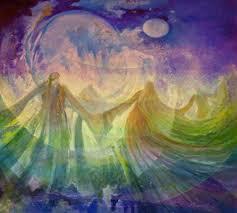 Like an eternal dance, the “choreography” of the Divine Being is singular in its diversity and diverse in its unity. And for church fathers, one beautiful way of understanding our salvation is our being invited into this dance. If this sounds foreign to our ears today, Jesus himself promised the same thing in John: “In that day you will know that I am in my Father, and you in me, and I in you…. If anyone loves me, he will keep my word, and my Father will love him, and we will come to him and make our home with him” (John 14:20, 23). Many others through the centuries of the church history have echoed the theme of union and communion with God as the heart of being a Christian. Participation in the divine dance of the Trinity is the heart of the Christian life. The whole dance, or drama, or pattern of this three-Personal life is to be played out in each one of us: or (putting it the other way round) each one of us has got to enter that pattern, take his place in the dance. There is no other way to the happiness for which we were made … Once a man is united to God, how could he not live forever? … But how is he to be united to God? How is it possible for us to be taken into the three-Personal life? … Now the whole offer which Christianity makes is this: that we can, if we let God have His way, come to share in the life of Christ … The whole purpose of becoming a Christian is simply nothing else." I don’t know about you, dear reader, but I am so humbled and amazed that we have been invited into relationship with a Triune God who is in constant relationship, “dancing” with each other in the Godhead. Now we are in that very “dance,” not as “god” but as new creations in Christ … as unique masterpieces in the body of Christ. Think about that … deeply! I pray that they will all be one, just as you and I are one—as you are in me, Father, and I am in you. And may they be in us so that the world will believe you sent me. I have given them the glory you gave me, so they may be one as we are one. O righteous Father, the world doesn’t know you, but I do; and these disciples know you sent me. I have revealed you to them, and I will continue to do so. Then your love for me will be in them, and I will be in them.